The adult red-bellied lemur is about of 34 to 40 centimetres long and a tail length which is almost twenty per cent longer than the body itself. Both males and females are chestnut brown in colour but are easily told apart as only males have a red belly while females have a white one. Here at Wild Place Project we have two Red-bellied lemurs. You can get up-close to our lemur family in their walk-through enclosure in Discover Madagascar from 10.30am – 3.30pm. Similar to other species of lemur the red-bellied lemur's diet in the wild is mainly made up of fruit. However, they do often forage on plants, flowers, leaves and some small invertebrates. 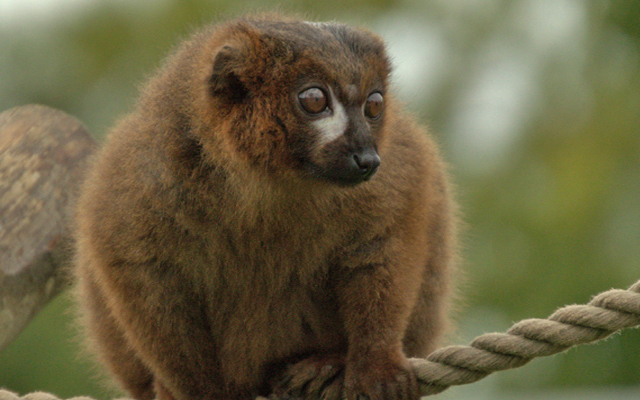 The red-bellied lemur is native to eastern Madagascar. They live in primary and secondary rainforests at medium to high altitudes. The red-bellied lemur is classified at vulnerable. The main threat that they face is habitat loss with almost 90% of the eastern rainforest in Madagascar being destroyed since humans have lived on the island. The forests are mainly being destroyed by slash-and-burn farming, logging and mining. In some areas, there is also the threat of hunting. You can learn more about the red-bellied lemurs' conservation status on the IUCN Red List of Threatened Species website.